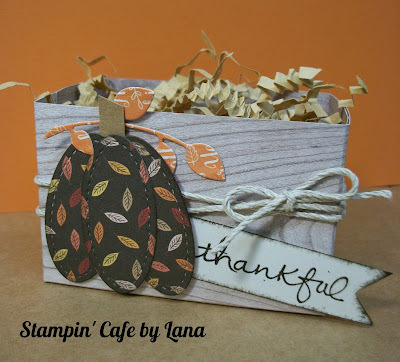 Welcome to Stampin' Friends Blog Hop for October. This month we are creating giving thanks or Thanksgiving cards and projects. I created this card by embossing some Early Espresso Cardstock with a fall leaf embossing folder, adding a small border at the bottom using a borders die, and making a pumpkin using several layered ovals cut with stitched dies. I added some die cut leaves, the "grateful" word die, and stamped "for you" onto a small hand cut white banner. For the picket fencce, I cut some strips from wood textures paper, dog-eared the tops, and laid them out in a picket fence pattern. I also made a little "wooden crate" to go along with my card. These would make perfect table favors for Thanksgiving! I made the same oval layered pumpkin, added some die cut leaves and a "thankful" banner. I added some crinkle paper to the inside of the crate, and tied some twine around it. You can use a die cut for the crate or hand make one with a 6 x 6 piece of wood textures paper, scored at 1-1/2" and 4-1/2" on one side and at 2" and 4" on the other side. Either way, it creates a darling little "wooden crate". 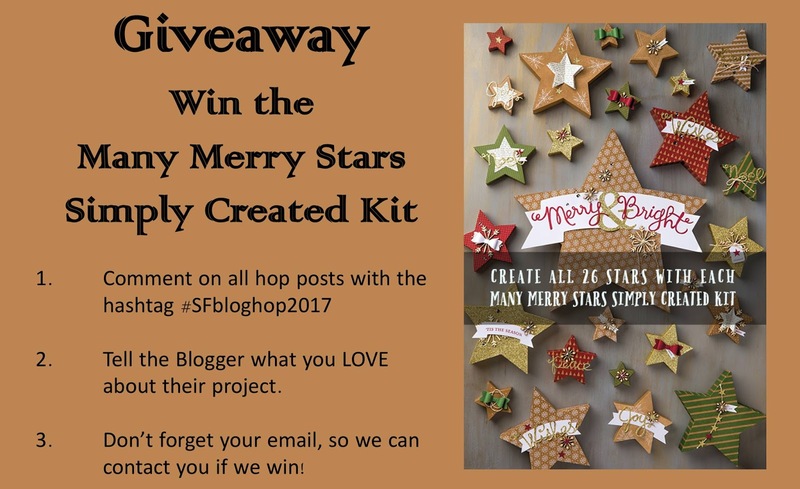 There is a Giveaway this month! 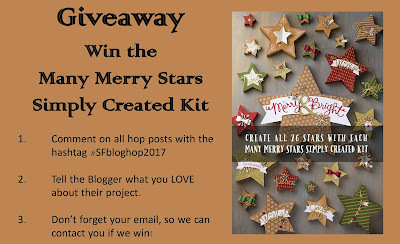 Comment on the blogs with the hashtag as shown below and have a chance to win this super kit! Now come follow along with the other hoppers to see what they have created for you this month! lana love, love, love your pumpkin card. Great use of DSP and what a cute fence. Thanks sop much for sharing your talent. Very Cute! Thanks for sharing!!! that would be great for craft fairs! love it! Thank you Kathy! Thanks for stopping by and commenting! Thank you Cheryl! Thanks for visiting and commenting! I love the little crate! Thanks for sharing! Thank you Diane! Thanks for visiting my blog and commenting! Adorable projects!!! I love using Wood DSP for the fence..such cute projects! Thank you so much Karen! Thanks for stopping by! Super cute. Love the layered pupmpkins. Thank you Iris! Thanks for visiting and commenting! Lana .. love the card. I need to get busy and make a box!!! Thank you Crystal! Thanks for stopping by and commenting! Lana, great pumpkins! I love them using the stitched framelits. Great idea.